Great practical add-on to any anchor. Over-engineered. Allow to easy inspection. No impact to roller – pass smoothly. I have a 3/8 HT chain and its perfect. Typically a swivel is the “weakest” link, but in our case it was a real step up in securely connecting the chain to the anchor. We were limited in the size of shackle that would fit in our anchor chain. Mantus has solved this issue with pieces that fit within an oval 3/8″ HT chain, allowing us to beef up the connection. This swivel is a serious piece of hardware and is well engineered. Awesome engineering! Easy to install and have confidence she will hold when I need it. We have 5/16 G4 on our 34′ catamaran sailboat, so I went with the S2. Extremely beefy product with excellent engineering. Easy to install and works smoothly with bow roller and Lewmar 1000. Very pleased. The swivel was shipped out the same day I ordered it and arrived on time. It was easy to mount seems to be very well made. Have not had a chance to try it out yet but looks to be a winner! Installed on Boat not yet used,BUT the stoutest swivel I have ever seen. Very happy with this swivel so far! We have only used it once but it worked well and looks to be built very robustly. A very sturdy looking swivel compared to the others available, that is for sure. Worth the money! This is a very high quality product that sets the standard I believe. Can’t go wrong. I saw this at the fort laurderdale boat show and had to have one. I replaced two shackles with the S2 on my 66 pound claw. My wife can now swing the anchor around with her foot rather than me having to go forward and make some back breaking adjustments. Great buy and great price. Super product, really happy with it. It is a joy to behold simplicity and it’s strength. The team at Mantus were very helpful in answering all my questions and facilitating shipping needs. I wish them every success with this product and look forward to getting it up and running on the boat. Recently ordered a S-3 Anchor Swivel. Swivel is of high quality and works well. However, when I received the package, there were no instruction for assembly, where to wrap the teflon tape and how to safety wire the swivel parts. I had to go online to the Mantus Anchor website to find and download the assembly instructions. Then, according to their instructions, you are suppose to make two wraps of safety wire around each half of the swivel. Unfortunately, the pre-cut safety wires supplied with the swivel were too short and I could not make a double wrap around each half of the swivel. I ended up having to use my own safety wire to be sure I could make the required wraps as per the instructions. I have had several anchor swivels and the Mantus anchor swivel is by far the best and it is priced very reasonable. Superior materials, simplistic and strong in design. Product shipped with easy to understand instructions, heavy duty attaching hardware and all of the safety wire precut and ready to be installed a very nice and personal touch indeed. Called and placed my order the staff was very friendly, knowledgeable and eager to please. Wonderful product and wonderful experience. The direction that came with the swivel made it easy to install. Step by step. Once one, it’s worked flawlessly having stuck it in sand as well as in grass. The added weight on the end of the shank of my Rocna makes it dig in even faster if that’s possible. Once pulled free, even after having been buried in sand for several days, it still swiveled great. Quite a piece of boat jewelry and functional as well. Upgraded windlass from manual to electric on our Pacific Seacraft Crealock 34 “Escape Pod” to go 300′ of 5/16 HT chain, since we’re aboard full time now and headed for the tropics. Looked at all of the options, and the Mantus S2 swivel was the clear choice. Also ordered the chain hook and medium bridle at the same time and love them, too. Very happy with the quality, speed of shipping, and the obvious brute strength of this swivel. Planning to order an oversized Mantus anchor to serve as a storm anchor. Already ordered their headlamps and a dingy anchor, too. Only difficulty I encountered in installations was securing the wires around the cone. The supplied wire appreared a little too stiff and were difficult to sieze up tightly. I liked the concept and hopefully solves the sever wearing on the wildcat due to the twisting chain. I liked the little Mantus anchor ! Thanks. Anchor swivels have always been a concern for us. We feel that we need the functionality of a swivel, but have never trusted the integrity of them. The design/construction of this swivel is amazingly perfect, allowing for regular inspection of the entire swivel, not just the visible parts. Great job, Mantus! This looks like a pretty well engineered product. My only concern is the pin holding the chain does not seem as taunt as I would like. Most of it is above the swivel cone (S1 with 5/16 HT chain) and it is just a tad sloppy. The instructions are a bit scant. They send along a roll of teflon tape to wrap around the half pieces. Not sure how tight to do it. I guessed correctly and it allowed the cone barrel to snug up (I hope that is correct). 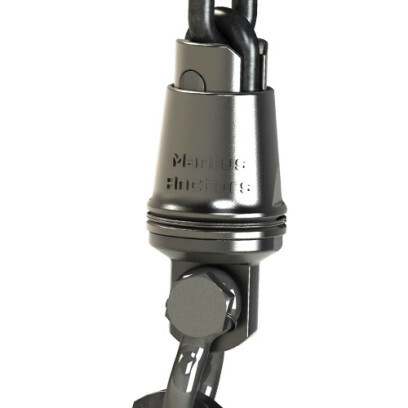 The stainless shackle is very high quality and is deep so as not to get hung up on the anchor at the hole. This really begs the question of needing a swivel in the first place. My plow anchor still comes up assbackwards so it is still a hassle to get it flipped around to get it to come into the anchor rollers correct side up. This completes the upgrade of anchor number 2: Both swivels are the model S2, used with 5/16 G4 chain on a Hunter Passage 42. 300+ ft for the main anchor and 100 for he secondary. Both are backed w line. Installation was, again, quite easy. One of the things I really like is the bolt used on the shackle: much less likely to hang on things compared to typical shackles with an end that sticks out. Recently ordered the model S2 swivel directly off the website for our 10mm chain , what suprised me first was extremely quick shipping with Fedex to europe and 2nd the weight and engineering that went into this ! I bought the S1 swivel along with a new stainless 17lb Mantus anchor. What a perfect combo! The swivel is very heavy duty and well made. I especially like the oval pin used to connect the chain to the swivel. That thing is never going to break!!! Installation was a little awkward using the stainless lock wire, so I opted to use the lock wire only on the shackle, and then used a stainless cotter pin to secure the hood of the swivel. It was much easier and just as secure. I also suggest using a decent amount of the supplied teflon tape as it will take out the play once you screw on the hood. The swivel is much larger than what I had before, but the anchor comes up perfectly faced down everytime now! I’m very pleased with both items! All works perfectly – exactly as designed. There are so many low-grade imitations on the market – getting superlative quality at a reasonable price from Mantus was just awesome! When we add another anchor – it will definitely be a Mantus!